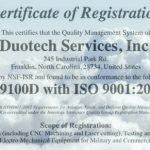 Duotech Services, Inc. completed AS9100C registration with the scope of design, repair, testing, production, and overhaul services of electronic and electromechanical equipment for military and commercial applications. 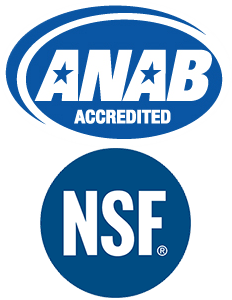 The AS9100C quality management system is a globally recognized standard for aerospace suppliers, manufacturers, and service providers. At the time of registration, Duotech joins a group of companies that number around five hundred worldwide. 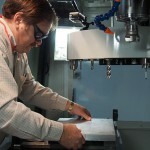 As a result of Duotech’s desire to compete globally and gain recognition as a quality aerospace supplier, AS9100C registration provides a high level of confidence and assurance to domestic and foreign customers that their supply chain partners are providing superior quality products and services. 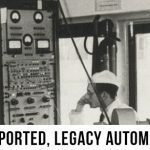 This encapsulates and goes beyond ISO 9001:2008 With the assessment and qualification performed by an independent third party, this validation facilitates product safety, independent feedback, internal validation, on-time product delivery, and continuous improvement. 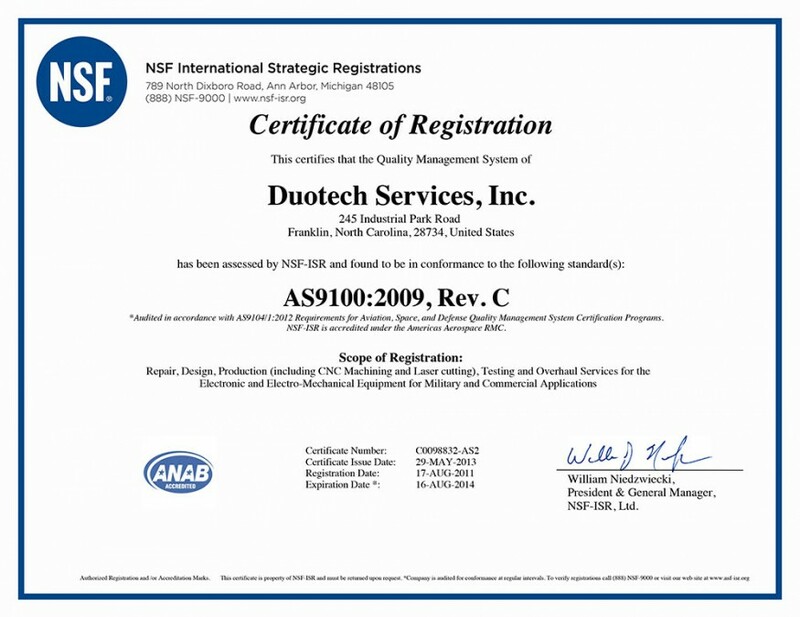 This quality standard sets Duotech apart among major aerospace OEMs, aircraft power plant manufacturers, and aircraft systems designers. 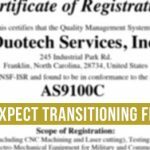 Duotech is a Requirements Driven Company structured to solve the engineering, reverse engineering, repair and re-manufacturing problems of military and civilian agencies, as well as aerospace and commercial users of electronic and electromechanical equipment. 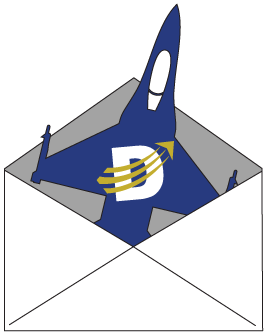 Since 1982, Duotech has offered the very best in engineering laboratories, depot repair facilities, and technical services to Department of Defense agencies, prime contractors, and over 30 foreign countries. Completion and maintenance of this quality standard fulfill Duotech’s mission to provide superior quality services to our customers within the budgeted schedule and cost.